February, 7, 2018 Istanbul, Turkey – Devexperts, the developer of trading platforms and market data solutions, has successfully passed conformance tests and obtained Advanced Level FIX certificates for Equity and Derivatives Markets from Borsa Istanbul. 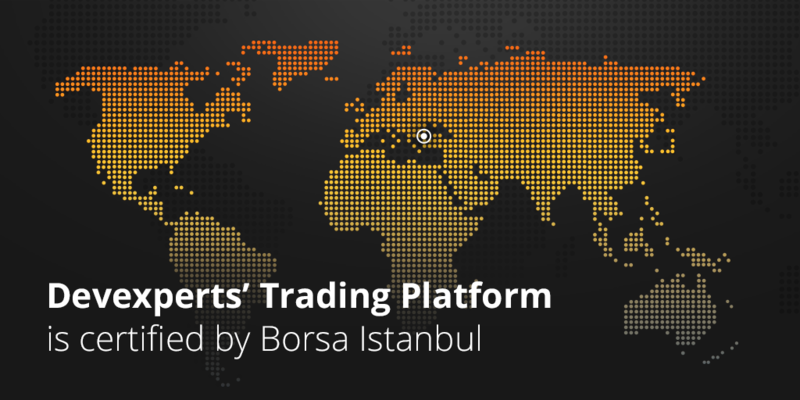 The certifications from Borsa Istanbul assure that dxTrade, the multi-asset and multi-market trading platform developed by Devexperts, satisfies the requirements for executing advanced level and market making orders directly at the Borsa Istanbul Exchange. This compliance makes dxTrade a procurable solution for Turkish Capital Market participants ranging from enterprises (including brokers and banks) to medium size portfolio management companies. The platform is available for white-labeling and customization. dxTrade platform supports multiple asset classes – stocks, options, futures, commodities, forex, cryptocurrency and other international markets. It is a highly scalable solution and is built of multiple components, which support high volumes of customers and transactions and may fit into any existing infrastructure. Unlike the boxed trading platform products, any component of dxTrade can be tailored to the client’s environment. This introduces a host of competitive business advantages: customized front-end services for traders, mobile applications, client on-boarding, KYC, back-end processing, 3rd party connectivity or any other component.